"Expect the unexpected." This is what I told myself last night. Seriously, I didn't feel a thing yesterday although I know SPM results will be released today. I mean, I felt normal. It surprised me too that I did not tweet anything about this SPM thing at all lollll and my parents kept asking me if I'm nervous. I think it's pointless to feel nervous because SPM is already over and we can't change a thing about it anymore. Well, what's done cannot be undone! And my mum told me to keep calm and just accept whatever it is even though I might not get what I want. Please la mum, I'm calmer than you hahahaha! Keeping calm doesn't mean that I feel super confident of my results. I just simply feel that, as long as I have really worked hard for it, I'm proud and happy of myself already. And I actually paid a lot of effort on improving certain subjects like Add Maths, Chemistry, etc. Of course, I'm aiming for straight A's all the while. Now let me tell you a secret. Deep down in my heart, I was actually nervous like hell. But honestly, I really felt nothing about it in the afternoon yesterday until I crawled to bed at night, I started to think of all the shits that might happen on me like..what if I couldn't get what I want. What if things happen so unexpectedly I might faint. Then I lowered down my expectations and I expected the worst results which I would get - 8A's out of 10A's. I didn't have time to think of A+ or A la, I don't care I just hope that I get 8A's and above. Then, I told myself that no matter what happens, just keep calm and smile. And I rolled on bed for so long, couldn't fall asleep,chatted with Teddy and realized that he's actually feeling the same as me. LOL!! Oh did I mention that I would reach my school late to collect my results? Surprisingly, I was invited by Nuffnang to attend a campaign in KDU college today at 11am. So early in the morning, I followed my mum to the gym which is near to the college, then after gym, mummy fetched me to KDU to attend the campaign. It was 10.30am when I reached KDU. That time I supposed my friends have already gotten their results but none of them had text me yet. So okay la, I just waited patiently for the event to start while anxiously praying that my friend would bring me good news. Before the event started, I got a text and it was from my best friend. "U got straight A's." The end. My eyes widened, my jaw almost dropped to my knee and I wanted to scream loudly in elation but hell I was in a private room and not allowed to scream as much as I want lolll. But I couldn't hesitate anymore! So I called her for reconfirmation. She sounded happy for me and she told me it's true that I got straight A's! Recalling back the moment when I was on my way to get my PMR results, it's my best friend who informed me my results before I got it myself too. THANK YOUUUUU HENG YE!! Okay, I suddenly felt so relieved as if all my worries and tensions had gone with the wind!!!! Can't describe how happy I am and it was so unexpected. I got 3A+, 2A and 5A-. Freak. It's even unexpected when I knew that I got A+ for ADD MATHS. It sounds damn surreal that I got A+ for it and you know what, I actually failed my Add Maths once when I was in form 4. Damn I know how I used to hate Add Maths and how I gradually fall in love with this subject and how I worked so hard for it. Thank you Mr Wong, my tutor who guided me during my learning process in form 5. Without him I would not freaking get an A+ for Add Maths. Honestly, I'm pleased, like really really pleased! For other subjects, I never expected an A for Physics and Chinese. I mean, they were both difficult for me and even my Chinese teacher said that the Chinese paper is too hard for high school students. But I made it. I got an A- for each of them. 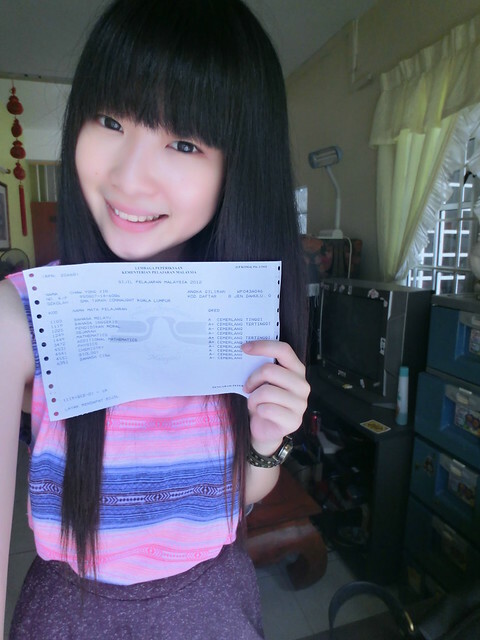 Actually I felt damn lucky too because many of my friends couldn't get straight A's because of Chinese paper! In a nutshell, I'm really satisfied with my results and I couldn't ask for more. 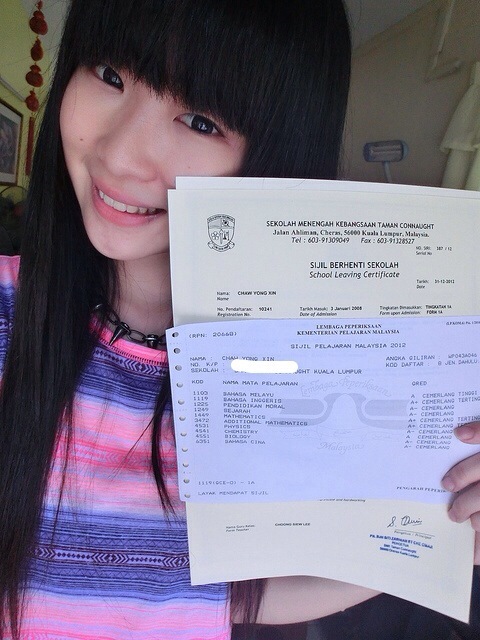 Yes, SPM results actually don't matter much but it's a sign that I've completed my high school education perfectly. Now I'm really, officially, graduated from high school. Thank you all the teachers, friends, tutor and family for the great support and patience! Called my tutor right after I got home!! I can't wait to tell him my results HAHA!! He still remembers me (I felt super happy that he remembers me) and he sounded so happy for my results! THANK YOU MY SIFU!!!!! I will never stop working harder. There's still a long way to go and tertiary education is just only the beginning of my new chapter in life. Michael Jordan - "I can accept failure, everyone fails at something. But I can't accept not trying." Therе is definаtely a grеat deal to find out about thiѕ subjеct.